After the presents have been opened and you have changed into your brand new Christmas clothes there’s only one thing everyone is waiting for – Christmas dinner. The smell of roast turkey is enough to tease anyone’s taste buds and roast potatoes are a favourite of any family. 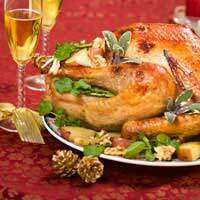 But did you know Christmas dinners around the world vary greatly? In Austria for example Fried Carp is a Christmas tradition. Then there’s Mexico where salad fruits and vegetables form the basis of the Christmas dinner. In Lithuania the main meal is served on Christmas Eve and consists of a mouth watering twelve meatless dishes. Over in the Netherlands rabbit and pheasant are the Christmas favourites, while in Germany suckling pig and white sausage are popular. But whatever you like on your Christmas dinner there’s one thing for sure, it always tastes better than any other meal that year! Getting the dinner perfect isn’t easy however. Making Christmas dinner, especially for a large number of people, can be quite stressful. You’ve got the in-laws round, the kids are running riot and your great aunt is making demands about how she wants her turkey! How do you manage to pull it off without getting any grey hairs? Simple, just use our guide with some helpful tips on how to avoid any turkey traumas and before you know it you’ll be relaxing with the family enjoying a delicious festive feast - with as little stress as possible. Did you know frozen vegetables have all the goodness of fresh? Well now you do. If you just don’t have the time to wash, chop and cook the vegetables, make it easy for yourself and buy some frozen ones. You can get all varieties in every different shape and size and they take a matter of minutes on the stove or in the microwave. Why make life more difficult for yourself than it need be? Let’s face it, on Christmas morning you want to be enjoying watching the kids play with their presents and greeting family and friends. What you don’t want is to be chained to a cooker all morning getting hot and bothered. Prepare as much food as possible the day before. The potatoes can be peeled and washed on Christmas Eve and left to soak and the turkey can be roasted and ready before Christmas morning. If your guests seem to get too full after the starter to appreciate the main meal, serve a salad in between. A small salad will cleanse the palate and leave your guests eager and waiting for the main event! In an ideal world you would grow your own vegetables, cook everything from scratch and finish with a delicious trifle made with your own fair hands that morning. But who lives in an ideal world? So don’t put too much pressure on yourself and instead take advantage of some of the delicious deserts available in shops. Alternatively, cook a Christmas cake weeks before the day. They last for ages and are delicious with brandy butter.